BELLEVILLE, Kan. (August 4, 2018) – Jake Bubak left no question about it and the near-capacity crowd enjoyed every moment of it. 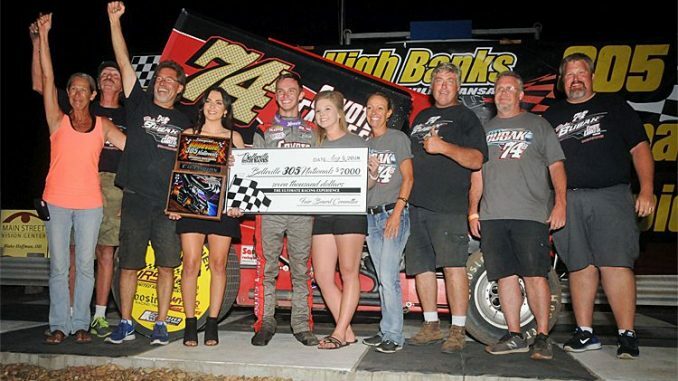 The Arvada, Colorado hotshoe turned in a spotless performance atop the lightning-fast Belleville High Banks on Saturday night to snare the $7,000 winner’s share over a field of 51 entries in the United Rebel Sprint Series-sanctioned Inaugural Belleville 305 Sprint Car Nationals. After winning his heat race from the fifth starting position and then rallying from sixth to win his qualifier, Bubak jumped out to the lead at the drop of the green flag in the 30-lap championship feature and led all the way as he lapped two-thirds of the feature field in the process as he ripped the cushion of the legendary oval. Bubak added the $7,000 payday to the $2,500 that he collected by winning Friday’s preliminary feature aboard the Coyote Candle Company No. 74b entry. “You just have to get up top and get after it,” Bubak said of his mastery of the ½-mile Belleville High Banks clay oval. After earning the pole position for the main event, Bubak led the way to the green flag with Oklahoma City’s Andy Shouse alongside. Shouse tried to challenge in the opening pair of corners but Bubak surged into the lead exiting turn two with Jake Martens slipping into second. Shouse recaptured second and soon after had one last shot at Bubak following the race’s lone caution with three laps in the books for Steven Richardson’s turn two spin but was unable to make it stick. From there, Bubak set a pace that simply could not be matched over the final non-stop 27 circuits. Bubak reached traffic by the tenth round and spent the remaining 20 circuits rapidly slicing through lapped cars with precision, ultimately lapping all the way up to eighth place and taking the checkered flag with nearly a half-lap advantage. While Bubak set the pace, Alamogordo, New Mexico’s Kyle McCutcheon took third away from Martens on the fourth round and then disposed of Shouse for second just two laps later. Attacking the turn one railing on several occasions, McCutcheon tried to keep pace but to no avail. “You’re a beast here,” McCutcheon exclaimed to Bubak in victory lane. McCutcheon settled for a healthy $3,500 payday in second place aboard the Lubbock Wrecker Service/Steward Builders No. 224 as eight lapped cars separated the lead duo at the finish. After starting ninth, Jason Martin worked his way up to fourth by the ninth round and then commandeered the third position over the final half of the race to fill out the podium. J.D. Johnson charged from 14th to fourth with Shouse rounding out the top five. Zach Blurton crossed the stripe sixth with Brandon Long and Tim Crawley the final cars on the lead lap in seventh and eighth, respectively. Kevin Ramey was ninth with Martens completing the top ten. Crawley, Bubak, Ramey, Jeremy Huish, Shouse and Ty Williams topped heat race action with Jordan Knight, Bubak, Blurton and Long winning the qualifying races. Brandon Hanks and Williams scored “B” Main wins. Heat One (8 Laps): 1. 45k-Tim Crawley, 2. 48-Jake Martens, 3. 9d-Lance Davis, 4. 74-Patrick Bourke, 5. 2-Logan Payne, 6. 6-Travis Scott, 7. 99-Dalton Stevens, 8. 29s-Blake Scott, 9. 0-Michael Scott. Heat Two (8 Laps): 1. 74b-Jake Bubak, 2. 02-Brandon Long, 3. E85-Ray Seemann, 4. 2d-Dusty Ballenger, 5. 49-Luke Cranston, 6. 7-Toby Chapman, 7. 11k-Tyler Knight, 8. 24-Cody Hays, 9. 43-Skyar Hughes. Heat Three (8 Laps): 1. 7m-Kevin Ramey, 2. 0z-Steven Richardson, 3. 45-Monte Ferreira, 4. 5x-Jason Martin, 5. 2J-Zach Blurton, 6. 11x-Brandon Hanks, 7. 7x-Shane Sundquist, 8. 17-Todd Plemons, 9. 33k-Aaron Ploussard. Heat Four (8 Laps): 1. 88J-Jeremy Huish, 2. 50-Jed Werner, 3. 10-George White, 4. 82c-Christian Kinnison, 5. 10x-Jordan Knight, 6. 98-J.D. Johnson, 7. 35-Chad Koch, 8. 95-Buddy Tubbs. Heat Five (8 Laps): 1. 27-Andy Shouse, 2. V8-Robert Vetter, 3. 19-Wes Wofford, 4. 23s-Stu Snyder, 5. 18-Lorne Wofford, 6. 28-Tracey Hill, 7. 75-Nick Nichols, 8. 21-Brad Wasson. Heat Six (8 Laps): 1. 911-Ty Williams, 2. 69-Mike Moore, 3. 224-Kyle McCutcheon, 4. 22-Kaleb Johnson, 5. 9-John Webster, 6. 2b-Brett Becker, 7. 17s-Chad Salem, 8. 45c-Lonnie Cox. Qualifier One (8 Laps): 1. 10x-Jordan Knight, 2. 27-Andy Shouse, 3. 5x-Jason Martin, 4. 50-Jed Werner, 5. 45k-Tim Crawley, 6. 911-Ty Williams, 7. 11x-Brandon Hanks, 8. 19-Wes Wofford, 9. 2-Logan Payne, 10. 35-Chad Koch, 11. 9-John Webster, 12. 0-Michael Scott, 13. 21-Brad Wasson (DNS). Qualifier Two (8 Laps): 1. 74b-Jake Bubak, 2. E85-Ray Seemann, 3. 23s-Stu Snyder, 4. 10-George White, 5. V8-Robert Vetter, 6. 88J-Jeremy Huish, 7. 99-Dalton Stevens, 8. 74-Patrick Bourke, 9. 28-Tracey Hill, 10. 18-Lorne Wofford, 11. 33k-Aaron Ploussard, 12. 75-Nick Nichols, 13. 24-Cody Hays (DNS). Qualifier Three (8 Laps): 1. 2J-Zach Blurton, 2. 0z-Steven Richardson, 3. 224-Kyle McCutcheon, 4. 98-J.D. Johnson, 5. 82c-Christian Kinnison, 6. 45-Monte Ferreira, 7. 69-Mike Moore, 8. 22-Kaleb Johnson, 9. 11k-Tyler Knight, 10. 45c-Lonnie Cox, 11. 17-Todd Plemons, 12. 17s-Chad Salem, 13. 43-Skylar Hughes. Qualifier Four (8 Laps): 1. 02-Brandon Long, 2. 48-Jake Martens, 3. 9d-Lance Davis, 4. 7m-Kevin Ramey, 5. 2d-Dusty Ballenger, 6. 6-Travis Scott, 7. 7-Toby Chapman, 8. 95-Buddy Tubbs, 9. 7x-Shane Sundquist, 10. 2b-Brett Becker, 11. 29s-Blake Scott, 12. 49-Luke Cranston. “B” Feature One (12 Laps): 1. 11x-Brandon Hanks, 2. 10-George White, 3. 45-Monte Ferreira, 4. 2d-Dusty Ballenger, 5. 22-Kaleb Johnson, 6. 69-Mike Moore, 7. 19-Wes Wofford, 8. 2-Logan Payne, 9. 7x-Shane Sundquist, 10. V8-Robert Vetter, 11. 28-Tracey Hill, 12. 75-Nick Nichols, 13. 33k-Aaron Ploussard, 14. 9-John Webster, 15. 43-Skylar Hughes, 16. 17-Todd Plemons, 17. 49-Luke Cranston (DNS), 18. 21-Brad Wasson (DNS). “B” Feature Two (12 Laps): 1. 911-Ty Williams, 2. 99-Dalton Stevens, 3. 82c-Christian Kinnison, 4. 9d-Lance Davis, 5. 6-Travis Scott, 6. 95-Buddy Tubbs, 7. 7-Toby Chapman, 8. 74-Patrick Bourke, 9. 29s-Blake Scott, 10. 2b-Brett Becker, 11. 11k-Tyler Knight, 12. 45c-Lonnie Cox, 13. 35-Chad Koch, 14. 17s-Chad Salem, 15. 0-Michael Scott, 16. 18-Lorne Wofford, 17. 24-Cody Hays (DNS). “A” Main (30 Laps): 1. 74b-Jake Bubak (1) [$7,000], 2. 224-Kyle McCutcheon (4) [$3,500], 3. 5x-Jason Martin (11) [$3,000], 4. 98-J.D. Johnson (14) [$2,500], 5. 27-Andy Shouse (2) [$2,000], 6. 2J-Zach Blurton (6) [$1,750], 7. 02-Brandon Long (7) [$1,650], 8. 45k-Tim Crawley (12) [$1,600], 9. 7m-Kevin Ramey (10) [$1,550], 10. 48-Jake Martens (3) [$1,500], 11. 88J-Jeremey Huish (15) [$1,450], 12. 23s-Stu Snyder (8) [$1,400], 13. 911-Ty Williams (18) [$1,350], 14. 0z-Steven Richardson (5) [$1,300], 15. 99-Dalton Stevens (20) [$1,250], 16. 82c-Christian Kinnison (22) [$1,200], 17. 50-Jed Werner (16) [$1,150], 18. E85-Ray Seemann (13) [$1,100], 19. 10x-Jordan Knight (9) [$1,050], 20. 2d-Dusty Ballenger (23) [$1,050], 21. 9d-Lance Davis (24) [$1,050], 22. 45-Monty Ferreira (21) [$1,000], 23. 10-George White (19) [$1,000], 24. 11x-Brandon Hanks (17) [$1,000].